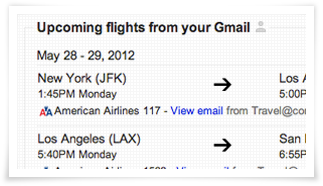 Google announced they are having an opt in field trial of including Gmail emails, contacts and flights in the right hand side bar of the Google search results. So if you search in Google for something and Google thinks a relevant email or contact or flight is relevant to your search, Google will show a section in the top right of matching emails. Note, the emails are now shown by default. (1) You need to opt in to the field trial (not available for Google Apps users). 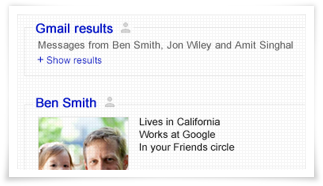 There is a tremendous panic around Google showing personal emails in your Google search results. Which is a bit crazy because you need to opt into it to see it. But I can see how people would be concerned. 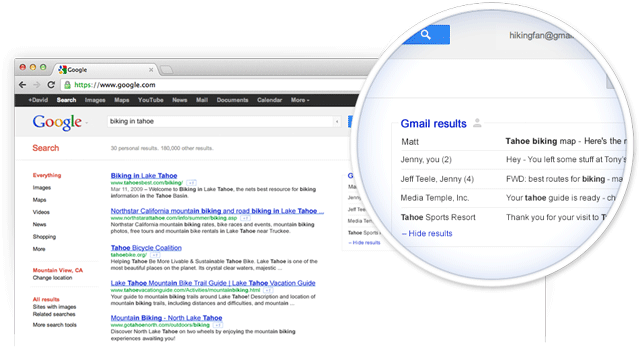 Google is searching the open web and your personal email in the same query. I may be outside of the normal use case here, and absolutely I am giving my opinion so judge it as one voice in 255 million (or whatever gmail's user count is now), but this isn't ever faster for me. I always have a gmail tab open. As to remembering the source of a piece information, I made no claim to be perfect at this. What I will claim is that for the 95% of the time that I DO know the source of a piece of information I will be annoyed by results that are not from my intended search space. Obviously Google has a pretty good track record at returning relevant results, but I can still hope for an off/on switch. At the event, they demonstrated that the same one-click toggle to disable personalized results will also disable the results from Gmail. It's not in our enlightened self-interest to push information that's unhelpful or jarring, because then you're less likely to search on Google in the future. As the post mentions, this is a trial and you need to sign up here (g.co/searchtrial) to use it. Because there is so much Gmail content, this is a technical challenge that’s difficult to scale, so this field trial has a limited number of users that can be admitted and will cap at one million users. This forum subcategory is a place for you to discuss this new feature and share your feedback. Please note that when the field trial is over, this subcategory will be deleted, but all of the posts will still be available in the overall Web Search forum. Forum discussion at HackerNews, WebmasterWorld and Google Web Search Help.